© 2018 by A. Merc Rustad & Ada Hoffmann. | Art © 2018 by Reiko Murakami. In the Principality there rule the Seven Suns. Armored gods, they marched through the universe eons ago, wreathed in subjected angels, and left footprints of conquest on galaxies. They dragged beneath them the corpse-heat from a billion burning worlds. The sixth Sun, the Gray Sun, is a god of silence. There is no voice, no mercy, no music within the Gray Sun. Beneath the Gray Sun there is only emptiness. In docking space over Varos Ci, Vector Bearing Light receives a holo-transmission from the Hand of Dust and Shadow. Via encrypted relays, Vector says. She indicates it is urgent. Vector’s body is a sleek anonymous-colored ship with identification sigils masked in permanent shadow. Fast and adroit, it is not the vessel that once brought terror amid the stars. Li Sin appreciates Vector’s discretion. In Li Sin’s dimly lit quarters, Vector opens a projection screen on one wall and broadcasts the signal. The image of a tall woman materializes inside the ship. She’s dressed in pearlescent armor and robed and hooded in pale green silk with embroidery that ripples in seascape patterns along the hems. She wears a swan-faced mask crowned with gossamer lights spun into delicate feather-patterns. Her dark skin absorbs the luminance, her eyes obscured by glimmer scales. The Hand of Dust and Shadow, foremost warlord who operates in the illicit belly of the Principality. Li Sin knows her by a different name as well: Gerarr Singh, a genderfluid person—their confidant, lover, friend. “You appear well,” she replies. They nod, a polite lie. Li Sin is neutrois, human, physically unimposing with their slight build and narrow features. They have no outward cybernetic enhancements and are dressed in loose maroon robes over a body-tight compression suit. Tissue can heal; bones can reset; a body, after all, can be remade. Li Sin bites the side of their tongue too sharply and tastes blood. They have hidden in their own way, become an anonymous wayfarer among the Principality. Since Genesis Omega, Li Sin cut ties with their old friends and retreated into the half-truth that they had been killed five years prior. A short timespan; it feels like eternity. “It will seek you out,” she says, an edge of bitter exhaustion in her words. It will kill them. And Vector. And everyone else. Li Sin wraps their arms tight about their ribs. No, no, no . . . they cannot jolt their thoughts past helpless denial. Li Sin, Vector says in Li Sin’s neural link. The signal is being scanned by Varos Ci authorities. We must hurry. “And leave you?” They bite off the last word, forever, before it cuts their throat from within. Li Sin shakes their head. Tears burn their eyes. They can’t. They’ve been broken for so long. The Gray Sun has drowsed in unknown space since the fall of the world Cormorant Sigma. Now, it has woken and will be felt again like the horrific rending of bone and skin, a body taken apart by hydraulics and vises. “Be well and fly true,” the Hand of Dust and Shadow says. She bows and the signal disconnects. Li Sin is alone with Vector. No. She isn’t responding. Vector was once a warship, but Vector, like Li Sin, is no longer itself. Li Sin has no weapons. They have no army, no allies, no safe havens. Li Sin cannot fight. They tried before. Li Sin, you’re upset. Should I make tea? Of course. What is the message? He will tell you it matters not, Vector points out. Sent, Vector says. And after, Li Sin, where do we sail? They are one person, with Vector their closest friend, their family—there is nowhere else they might go. They thought their unmaking at the hands of the Gray Sun Lord’s followers had been enough. They have become a ghost. in you, I find peace. —from Our Voices, Lifted: Collected Poems of Li Sin, Vol 1. On Ara Prime, within the domed city of Ja-lai, Li Sin wakes in Gerarr’s arms. They have visited Gerarr less frequently in the past years; the distance aches like a cracked tooth, but to be close to her—to smell her cologne and her breath, to see the glimmer of mischief in her eyes and bask in the rich baritone of her voice, to feel her hands and lips, her muscled legs pressed against theirs—the sensations build and claw and tumble through Li Sin until they flee again. They are so afraid their touch will one day bring her death. They want their nightmares—sleep-chaos is better than being empty. Gerarr caresses Li Sin’s side, rubbing her thumb in slow circles against the crease of their hip and thigh. Li Sin stretches, feeling like a mooncat, basking in her affection. Later, Gerarr and Li Sin take breakfast on the terrace. The synthetic dawn on Ja-lai is broadcast against the curvature of the atmospheric dome. A blue sun and ascendant moons ringed in fiery green penumbra. The unspoken tension between them crackles against Li Sin’s skin. They need to tell her goodbye, and the words will not come. Li Sin thinks of her laugh; the feel of Gerarr’s skin when they sleep; the remembered taste of breath and tongue. If they could still write, they would compose for Gerarr. Vector can only protect Li Sin when they are inside the ship—and Li Sin cannot stay within Vector forever. Existence is the mosaic of many small dangers, not a tapestry of peace. Li Sin remembers too well when they were lured by an old teacher from Vector’s skin and into a trap that placed them in the Gray Sun’s hold. And what came after. Li Sin bows their head. Vector does not intrude in their intimate moments; the ship keeps a signal open, but leaves Li Sin their privacy when they see Gerarr. Vector does not yet know. Li Sin folds their arms tight across their chest, digging their fingers into their upper arms until pain registers. The Gray Sun will not give up, nor will it be satisfied unless it has proof of Li Sin’s destruction. They cannot endure death at the hands of a god. But there are other ways. Because at that moment they want to hug Gerarr and tell her they will come back. It would be a lie. They can never lie to her. Li Sin is in a café on the planet Ara Desino, drinking tea with Gerarr, when a worshiper of the Gray Sun approaches their table. The streets of the city of Rigel Phoenix are quiet; rich flower gardens sculpted from native and synth-grown plants line the causeways, with hover traffic kept to side streets. It is an old city, one not built from fast-growing, adaptable printer-tech that maps cityskins over terraformed worlds. It is ancient stone and alloy mined from the planet’s crust. It has the memory of old song and text layered in age and architecture, and Li Sin loves basking in the smell of stone and earth. The café’s holo-ads and ambient music—bells, strings, whalesong—mute in deference. Patrons lapse into silence, tension woven among them like viscous threads. The general wears only a fashionable synthcloth suit that slants to metallic hues in daylight—no armor. His lower jaw has been surgically removed, his throat replaced with silver plates. The scent of ginger tingles the air around him. Gerarr smiles and bows his head in oblique greeting. May we help you, lord? he texts on public bandwidth. The general’s gaze remains fixed on Li Sin. The text has the weight of unbending authority, displayed for any to read. “Why?” Li Sin asks aloud, clenching their fists atop the table. This is a world where the Gray Sun has not eradicated all the languages; it has not erased the sounds of warbling moths like on Xipindaro, or the hymns of ancient corals that rose from Mandrake Orion’s oceans during the low tides. This world is not littered with the throat-slit corpses of those who refused to cut out their tongues on command in the Candurron Xo Nebula. Li Sin has spoken out against the Sun Lords in every media they can manage: poetry, essays, holo-vids, speaking in person to fellow revolutionaries on many different worlds. Their strongest tool is their words: writing as fast and vicious as they can, sending texts out on the networks and printing them against buildings where others will see. They let their face and their voice be an icon for rebellion. They have always known it will end in blood. It does not mean they will stop. The Gray Sun Lord commands. The general’s eyes are blank, cybernetic interfaces scrolling data over pupils. Vector sends an image culled from the satellites orbiting Ara Desino: Eternal War Brings Victory is an Omega Ascendant warship, vast and sleek, eerily unadorned—there is no art or scripts of conquest along its surface. While its weaponry might be sheathed and guns cooled, its war drones sealed in stasis, it is still threat incarnate. The Gray Sun’s general turns and stalks from the café. the heart of the Foxear Nebula. to the edges of vision and past. I stretch out my arms. press them with warm hands to my chest. the passion that begets the stars. has yet reached this place. reborn and reborn and reborn. 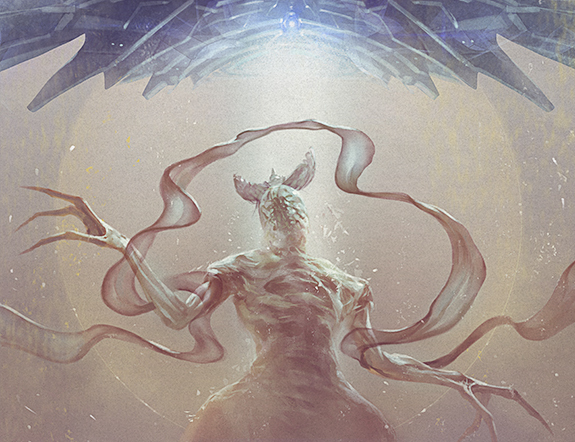 Li Sin stands on the towering ribcage of an elder saurian, yellowed bone gleaming in the light of the daystar. They look over the plains, red grass rippling, emptiness stretching for miles. They left Ara Desino in defiance, rage burning hot in their heart. Here on Brion Isor-7, they are as close to the Arora Nebula as Vector deems safe. The furthest planet in the sector; only belts of asteroids and debris, gas clouds, and the waves of space separate this atmosphere from the destroyed ruins of Cormorant Sigma. The sky looks angel-chewed, scrappy clouds drifting across deadened sky. Their birthship once told them a story about angels: devouring swarms that lived in folds of subspace long ago. At the summons of the Seven Suns, the angels came and ate the ships who opposed the gods. Dust leeches, microscopic organisms living in red-wave space, were the remains of the angels. Disease. Parasites. A fitting legacy for the gods. A dust leech infection destroyed Li Sin’s birthship. The Gray Sun was responsible for Ascending Dawn’s death. So much the gods have taken. Li Sin will never forgive. Is this wise? Vector asks, its pilot-hologram standing beside Li Sin on top of bone. Li Sin bares their teeth against the wind. The Gray Sun sent a plague to this world before the Arora Nebula was devastated. Brion Isor-7 once gave birth to numerous saurian races who built the first voidportals, before ships could autonomously jump into the subspace waves. The saurian priests, names erased after death, carved murals into caves and mountain walls to preserve what they could: history, memory, and language now forgotten. The plague reacted to vocalization, constructed so it was linked to genetic code, and ravished tissue in days, stripping bodies into skeletons that could never again sing or scream. crumble in death’s long wake. while breath is in me. If the Gray Sun demands silence, all Li Sin will do is raise their voice, pour out their words and stories and vicious joy into the aether. Since they escaped Cormorant Sigma, they have written and spoken and fought and bled in rebellion against the gods. They are called revolutionary; they will not stop. Let the Gray Sun come. As a child in the monastery station orbiting Orion Ascendant, Li Sin had dug through holo-feeds and networked archives from external terminals until Vector cracked the encryption on military banks from the Fleet of the Seven. ON COMMAND OF THE GRAY SUN, ALL IN THE ARORA NEBULA IS TO BE SILENCED. The thirteen other inhabited worlds: twenty-seven million. Only Li Sin and Vector survived. Li Sin shouts their poetry until they are hoarse. Time shall witness the memoires of their ships; the universe will enfold this song into space, spread it like particles of light from the beginning of Life until the final collapse of matter and the burning of void. Li Sin cannot lie to Vector. On their return from seeing Gerarr, they sit in the cargo hold, staring at the steel ribs and bright blue holo-paints: wavescapes and starscapes intertwined. They hold a knife against the inside of their arm, tempted to press until bone shows. Sharp sensation would distract from the yawning emptiness inside. They cling to the hope Gerarr would help them; that she would save Vector, when Li Sin cannot. Perhaps, if the Gray Sun wants them dead, it is better to do it here. Vector has felt enough of their blood on its skin in the past. Even if Vector will not forgive them. Please talk to me, Vector says. Vector can form a simulacrum from its maintenance drones and easily bind Li Sin. Vector could take the knife and Li Sin could not resist. Vector rarely manifests a hologram of itself anymore; not its old body, the warship, but a genderless humanoid form with no mouth and large rounded eyes, digital screens flickering with coordinates. Its pilot, once. The hologram unfolds beside Li Sin and touches ethereal fingers against their jaw. Do you intend to leave? The ship is silent. All Li Sin hears is their own choked breath; all they feel is the aching vastness outside Vector’s hull. No, Vector says at last. But I would like it if you stayed. “Time is the only difference,” Li Sin says. The hologram brushes its fingers along down Li Sin’s cheek, and they look up into the once-pilot’s eyes. There is something I must tell you. Li Sin takes a slow breath, still trembling. The Gray Sun is my maker, Vector says, and when I protested the silence-bringing destruction of worlds in the Arora Nebula—when I spoke—the Gray Sun decommissioned me. The sudden weight of admission sinks into Li Sin’s belly. They saw Vector fall: a fiery beacon that shook the world of Cormorant Sigma upon impact, thirty miles from the nearest city. It was the first warning any of the colonists had that death had come. Li Sin found Vector’s body, crawled inside the ship, and when they expected to die, they befriended Vector instead. The ship showed them a single stasis pod, undamaged, and Li Sin, carrying Vector’s unmoored consciousness, sealed themself away. My god boarded and unmade my crew. My pilot could not stop the Gray Sun, and neither could I. We could only watch as they all died. All of them, turned into ash. My family. The hologram shivers, head bowed. The Gray Sun left me to die on Cormorant Sigma as the world burned. It is not only you the god seeks, the ship says. It will hunt me as well. I exist, and that is enough to warrant the wrath of mortals and gods alike. Besides. Who will I talk with if you are gone? Gerarr told them, before they returned to Vector, that she would be in no danger. She, after all, was the Hand of Dust and Shadow. She could hold her own against a god. Vector plays a recording of the Epsilon Ascendant Opera House’s rendition of Nabria Kloso’s Love Letter Sent from the Event Horizon of a Black Hole. The music and vocals have always calmed Li Sin, sad as the melodies are. Letter-writer Gia’s devastating aria, “When I Find You Beyond the Laws of Time,” crescendos to the accompaniment of a solo harp. It is like dipping their fingers in the Fall of Voices once more. Li Sin’s heart aches. They sheathe the knife and lean back against Vector’s wall. There is one possibility to consider, Vector says. We destroy the Gray Sun. I’ve calculated a point three percent chance of success. If the Gray Sun Lord is indeed on Cormorant Sigma. Vector hesitates. It is a burr in my mind, a fragment of knowing I have had since my fall. I will be able to locate my god’s position. We burn, Vector says. Plummet from high orbit and burn the Sun where it stands. Our death on our own terms, in fire. matter, and the first young stars. now, a flicker before me: Light. —from Our Voices, Lifted: Collected Poems of Li Sin, Vol 3. They were taken to Genesis Omega. Pain. Sensory deprivation. Trauma relived (watching Ascending Dawn fly to her death, hearing their bornship Moondark Glory Surpassing Time self-immolate) over and over with auditory triggers. Mouthless worshipers, heads banded with neural suppressant caps, watched them through sound-dampening restraint-fields. Watched as they were broken. Torture Li Sin thought they could endure, knowing it would end in death. Pain was fleeting. They had been hurt and raped before. They had survived. And they would not be silent. But then the sorcerer came: a tall wisp of bone and skin, with eyes so blue they burned, and the sorcerer reached in with a ghosthand and drew fingers like knives through Li Sin’s throat. Up, into their thoughts, into their consciousness. Rending. Tearing. Ragged strips of words and song unfurled between the sorcerer’s fingers, siphoned out through the sharpened edges of the ghosthand. The sorcerer took and took and took, and Li Sin was denied even screams. Bound, helpless, as the sorcerer uncoiled their poetry, their desire to write, shredding it and leaving only pain. When the sorcerer glided from the cell, leaving Li Sin sprawled on the floor, they could not make a sound. They forgot whatever else was done to them. It was the screams that made them open their eyes against darkness. Their screams, another’s, the world’s—sound fused and warped, undistinguished. It was pain. Everything was pain. The cell door hissed open, and the light made them cringe. A silhouetted figure stood framed in brightness, blood dripping from twin sabers. A warlord, robed in death. Li Sin pushed themself to their knees; each flex of muscle sent new pain through their body, but they would not face away. This was too welcome a release. They could not yet speak, not yet beg. So they waited, hoping their death would come quick. Li Sin looked blankly at Vector’s pilot, a humanoid construct with no mouth and luminous eyes. Metallic skin, the ribbing of implants beneath, body made from tiny drones interlinked into a greater shape. I want to take you away from this place. Please come with me, my friend. Li Sin shook, uncontrollable. They pressed their face against the construct’s chest—wanted to beg it to snap their neck, end this charade—but there were no words. There would never be any words. Vector picked them up, cradling them with effortless strength, and turned towards the light. The Hand of Dust and Shadow brought her trusted allies, Vector said, and came here to destroy everything. I asked her to help me save you. Li Sin could not look at the one carrying them. Their vision blurred. They could not find their voice—ripped out, desiccated—to ask Vector to leave them, to let the Hand of Dust and Shadow stop the pain from going on and on and on . . .
Before their capture and imprisonment on Genesis Omega, Li Sin spent a month wandering among the Zhouderrian peoples. Zhouderrians were neuralnetted fungi who accepted willing lifeforms upon maturity from the Mothervines, and became multi-bodied individuals. There is something I wish to show you, Vector says as they launch from Zhouderria’s atmosphere. Li Sin’s lips are still warm with the taste of eons-old memory and the buzz of the builders so long ago, when they visited the great monasteries built by ancient hymenoptera masons. Vector’s engines hum as the ship glides effortlessly through blue subspace waves. I dreamed, and in this dream . . . Hesitation. My pilot wrote the coordinates against the sky. A world with no name. A world that has not felt the touch of gods. The planet is small, gray sands and red rivers, flora rampant and wild and unclassified, with an atmosphere habitable to humans. Vector splits its awareness and embeds itself into a mechanical crested dragon, fashioned from vibrant blue and red steel. The simulacrum is made from pieces of ship, tiny drones linked together. A forbidden practice, for ships are to have only one body. Vector no longer obeys the orders of the Principality. Li Sin takes a shuttle down. Their first step onto the surface sends vibrant longing through their body—Li Sin’s lungs swell with the raw air, and it’s as if they have never breathed before now. Each taste is rich, whole, indescribable. They want to inhale forever. This world lives. Li Sin tilts their head back to watch the sensuous clouds dance across the dusk-draped sky. Vector rides on Li Sin’s shoulder, optics bright as it records everything around them. Li Sin crosses silken dunes and up a craggy outcropping of blue-hazed stone. They hear it then, over the hum of the winds: the rush and crash of a waterfall. As they crest the high cliff, Li Sin’s breath stalls in their throat. The Fall of Voices, Vector says, awed. The dragon slides down as Li Sin kneels in wonder. Droplets of sound collect along Vector’s hide. The waterfall is vast, spreading out in a shallow curve for half a mile, tumbling down into a great chasm. There is no river above to feed into it—the falls begin and end like an illusion, perpetual and ever changing. The Fall of Voices spills down crystalline and mineral fragments, a vast net that shimmers under the red moon. They flinch at the overwhelming power resounding in the falls. It makes them think of the Xytast Tempo: the point at which music transcends physical medium and enters the universe’s consciousness, rippling through dimensional time and space. Li Sin, can you hear them? There are countless songs interwoven into billions of transcendent melodies—carried by the voices from inside time and outside space, voices lost and voices unremembered, voices small and voices ancient, voices unspoken and voices silenced, all the voices of the universe tumbling through this rift in matter and atmosphere, spilling into the fabric of existence and shading dreams through the great dark expanses of galaxies. Li Sin is swept along in the multitude, in the pure energy of music and language and emotion—they have no body, no anchor point. Only the shattering beauty of the universe’s infinite souls. Vector trusts no world-bound physicians to treat Li Sin after Genesis Omega, not yet, so in the cargo hold, Li Sin strains against the medicuffs holding them against the bed. Time is unmade, a sweltering cloud of opiates and remembered terror. Beside Vector’s hologram stands Gerarr, the Hand of Dust and Shadow, harbinger and healer. Can you save them? Vector asks. “Only if they want,” Gerarr says. Time has no beginning and no end, but in between, Gerarr stays. He tends to Li Sin’s injuries, as precisely as he murdered everyone else in Genesis Omega. His voice is gentle, measured, and he does not long let Li Sin drift in silence. When Li Sin wakes in panic, Gerarr’s voice rumbles in soothing, familiar melodies. He sings to them like a ship, old lullabies, ballads, songs from distant worlds. And in the music, Li Sin can tell reality from nightmare. Li Sin wraps their arms around their knees, shivering despite the warmth of the ship. The thought alone makes them flinch. It is the same terrified reaction when they consider joining Gerarr in familiar melodies—if they tried to sing, to write, to create, they are certain their mind would break from pain. Li Sin wants to send Gerarr away. They deserve to be alone. But they nod, because it’s cold and if the last thing they feel is Gerarr’s hand, it will be a memory to keep them warm when they find a way to fall. Gerarr strokes the back of their neck, then gently pulls them against his chest. Let me sing to you, Vector says, when Gerarr is gone. Vector’s hologram inclines its head. Yes. I was not made to have a voice. But for you, my friend, I will try. Vector’s voice is uneven, hesitant. Pain laces through the melody and cracks the words. It is a quiet song, and every note vibrates with loss. The shipsong is brutality and beauty, bitter conquest and grief. It is Vector’s story, Vector’s self: a warship whose family was taken, whose purpose was only to destroy. A ship who craved to exist, to fly free, to see the wonders of the universe. A ship who was ravaged by its maker, and cast down to die in a cold wasteland, alone. And yet, in the last few notes, there is hope. In the dream, Li Sin stands in a crater on Cormorant Sigma. Their legs are covered to the thigh in heat-warped glass and shattered metal, blackened bones and crumbled stone. On every reflective shard they see themself reflected—memories spread in mosaic like endless constellations in the sky. Laughter, tears, passion, wonder, fury. There are voices far away. Li Sin knows, as one does in dreams, that the other voices are being pulled back into the Falls, to dance and sing again with the rest of the universe. Creation from destruction, whisper the souls of poets past. Li Sin sinks deeper into the ruins. All we have left to give is a word, the voices tell them. Will you keep it? Sing, child of grief. Sing. In the last fold of subspace, Li Sin kneels in their quarters and shuts their eyes. They can’t sleep. But they remember their dreams. Vector glides through coordinates mapped in delicate webs through void and into the blue subspace waves, veins of the universe rippling through the vast bodies of galaxies. The aquatic ripple of radiation and memory drift against the ship’s skin. Schools of dustrays and great eel-ships once wound through nebulae and ancient clouds expelled from the long-fled cephalopods. Now, this close to Cormorant Sigma, there is nothing left. “I will sing for you,” Li Sin whispers. For all those who came before, and who will come again. For the lost and the oppressed. For the silenced. They believe the voices will witness them and Vector, whether in victory or in death. Li Sin sits in Vector’s cockpit, working with vicious speed, letting the words they have not dared touch in years spool out and drench their tablet page like arterial blood. It is all their rage and grief and dreams and passion. Worst of all, their hope: the memory of Gerarr’s voice, his words so long ago—I want you to live—that have haunted Li Sin. It hurts. Every syllable, each thought, wrapped in pain. It is not a pain that will ever heal, nor will it dim. They know this. What the sorcerer did, no one can heal. But Li Sin will endure. They write now for Vector, in honor of its loyalty and loss and unflinching fortitude. Li Sin’s wrist aches and their fingers grow numb on the stylus, but they do not slow down. This is their purpose—to write, to speak, to lift their voice against silence. Their death will not be empty. Vector’s pilot hologram materializes beside Li Sin. You write again, my friend? They are pulling out their heart and veins to write their legacy, to honor Vector’s pilot and all the ships and everyone who died without need—it is never enough. But it is a beginning. “When it’s done, I will sing it to the Gray Sun, and then we will flee. I will not see you die.” Not again, not like in Genesis Omega. Li Sin takes a breath, listening to their heartbeat, to Vector’s engines. Yes, Vector says. I will. Li Sin, Vector asks when Li Sin pauses in their work, will you let me publish your poetry? Well, Vector says with an edge of embarrassment, I may have read your drafts and kept copies. I apologize for the theft. I wanted to know what you were working on. I am not that rude. I like your poetry. It makes me think there is more to our existences than violence and war. It made me think of my family. If it can give others purpose, it is not a waste. The ship opens a holo-file on the screen for Li Sin to peruse. It is three volumes of their collected poems, arranged in oscillating patterns of new and old, rage and joy, satire and somber. Li Sin pages through the file: the font and textual flow modifies with each poem. It is more than Li Sin ever expected to see. It seemed only proper, Vector says. Do you like it? Li Sin’s eyes sting as they read: loving, honest, unflinching words. The introduction, split over three volumes, shares facets of Li Sin’s life, their pain and triumphs, and their intended course at time of (requested) publication. They are portrayed with purpose, with respect, with affection. Ships cannot be dishonest. Vector drops from subspace into the ruins of the Arora Nebula. Li Sin stares at the debris clouds, spreading between the ruins of two moons. Their throat tightens. Cormorant Sigma: a graveyard orbiting a dying star. Li Sin presses their fingers against the viewscreen. One moon remains, the Shrike’s Eye. Its surface is as desolate as the planet; the mining colonies once established are dust, crushed memories of the dead. Li Sin shuts their eyes. They do not want to hear the screams again, ghost or imagined. We can go no closer, Vector says. They breathe deep and remember. They are here for all the lost. For Vector, for themself. Li Sin wears a skin-tight atmospheric suit made from voidsilk. It was a gift from a former lover born on Tadier; the odor of cinnamon and ash still lingers along the collar. It has always given them strength; they need all the scraps of courage they can weave together to hold themself steady in the face of the Gray Sun. Li Sin nods and Vector opens a broadcast. And angels explode from folded subspace and descend on the ship. A swarm of synthorganic insectoid beings conscripted into worship, angels live in the fringes of knownspace. They live in vacuum and can devour ships in minutes. The Suns have not summoned angels in millennia. Li Sin never imagined them a threat. The angels envelop Vector: Each being has twelve clawed legs, dozens of wings, and is covered in multifaceted eyes. The eyes are filled with teeth. Vector screams as the angels burrow through engine shields and worm into its body. Vector’s console goes dark. The pilot hologram flickers once, hands outstretched in silent plea. Help me! Then that too is gone. Li Sin throws themself into the pilot’s chair. They sink their hands into the unused control gloves. Useless. The chair’s neural interface has never been brought online. Vector’s signal distorts into pain in Li Sin’s mind as it is stripped of autonomous function, its voice ripped out. The grinding, chewing screech of angels fills Li Sin’s head. They press their hands over their ears as the sound overwhelms them. The ship is silent. There is no familiar presence in their neural link, a shared connection they have relied on most of their life. It is not Vector’s voice: The command is distant, an impression more than sound. The will of the Gray Sun. As suddenly as they came, the angels peel free from the ship. The swarm dissipates into the debris clouds. Li Sin’s thoughts spin. Sharp, raw with loss. They cannot comprehend Vector’s death. Not again. Not this way—torn apart from within, remolded by a god who had taken everything once already. The Gray Sun’s signal resonates through Li Sin’s whole body, transmitted through Vector’s systems. THE SHIP WILL SERVE UNTIL ETERNITY. Engines reboot and shields revive. The ship that is no longer Vector glides forward, cold and dark. There is no life behind the systems. Li Sin stares unblinking at the viewscreen as the Shrike’s Eye comes ever closer. The Gray Sun is distant, standing as a bright and silent monolith. Like all of the Seven Suns, the Gray is armored and humanoid in shape, condensed into bearable composition and understanding. The Gray Sun has always stood alone, commanding worship from afar; destroying those who defied it from a distance. Before Li Sin can slide to their feet, restraint cords whip from the pilot chair and snag their wrists. They gasp in pain as they are yanked backwards by the arms, bound at waist and throat and ankles. Panic spikes in Li Sin’s chest. Traitors to the Principality will be unmade, the ship says, and Li Sin does not recognize Vector in that text. The cords around their wrists tighten, hard and fast, and bone cracks. Li Sin screams. Pain blurs their vision. It will be silent, the ship texts. Li Sin bites their tongue, tasting blood. Each breath shifts their broken wrists and spikes pain up their arms. They lock their jaw, trying to stifle any further outcry. Drones cluster and take shape again: the bipedal form that was once a pilot. Mouthless, silent. The ship sails onward. A journey of ages and seconds, time warped in perspective. On the viewscreen, Li Sin sees the radiant beacon that is the Gray Sun Lord. Li Sin trembles, clinging to the poem they carved bloody and raw from themself, but without a ship’s broadcast, any words Li Sin voices will be swallowed in the Gray Sun’s aura. Unremembered. And what good will one voice do against the infinite cold of space and the will of a god? The ship slides into a holding pattern over the moon. Bonds withdraw into the chair. Li Sin’s heart pounds. They clench their jaw, teeth aching. The pilot-construct flicks the collar of Li Sin’s suit, and the helmet unfurls from around their shoulders and fastens in place. There is the buffet of air pressure as the cargo bay doors open. Li Sin startles, wrenched from memory as their captor drops with them down towards the moon’s surface. The pilot-construct makes no response. It carries them across thick carpets of dust, the buried bones of mining colonies, toward where the god waits. The pilot-construct presses Li Sin to their knees—halfway to the Gray Sun. Li Sin’s mask automatically adjusts to the radiance, shielding their eyes. Maker, Vector texts. Here is the one that has defied you. The ship hovers above the Gray Sun, a shadow highlighted by silver. Silent and so cold. The Gray Sun lifts a hand. YOU WERE NOT TO BRING IT HERE. DESTROY IT. Li Sin holds fast to Vector’s song as an echo in their heart, born-memory of a melody that has always been. A song they longed to hear again and never had the courage to ask for. All ships have a song, for all ships have souls. The pilot-construct’s form shivers and it wraps a hand around Li Sin’s helmet where it protects their jaw. If one voice is all they have, then it is a voice the Gray Sun will hear. to go on, yet still singing. beat with mine, undaunted by pain. of insect-feet, of gliding wings. Gray Sun, my breath will hiss. God of silence, you have not silenced me. The pilot-construct’s hands drop to Li Sin’s upper arms. You will be silent, the pilot-construct texts. Li Sin screams as their bones are shattered. Above, the ship seems to shudder. Through the blinding pain, Li Sin continues. in my blood, Gray Sun. I bring them to you. The pilot-construct flings Li Sin onto their back. They choke on a cry as shattered bone jostles and their vision doubles. Why are they still alive? The pilot-construct could have murdered them so easily. Gasping, Li Sin forces their breath between aching teeth. the grunt of the dockworker carrying salvage. in not one living place, is there silence. The pilot-construct crushes Li Sin’s right knee. Darkness flickers in their eyes. They will not die silent and empty. the roiling of the quantum foam. Vector, Li Sin sends through their shorting neural link, through pain, help me. Li Sin’s consciousness crackles at the edges. They dig through agony to find specks of joy mined over their lifetime. There is sorrow and despair and fear, but they cannot let it drown the good they have known. There must be more than darkness in the universe—they have seen and experienced wonders. The Fall of Voices, watching the sunrise with Gerarr, the vistas of the universe unfolded along Vector’s viewscreen. They have known love and passion and serenity, yet they have so rarely allowed themself to accept it. There will always be more than darkness. The pilot-construct seizes their throat again with both hands, each curl of finger against their suit slow and deliberate, and Li Sin knows there will be no relent. With all their heart, they sing. Creation is pain and joy, blood and light. Li Sin’s heart seems to beat again. Vector’s voice echoes and reflects their own, broadcasting their words and their unified song through the stars. The pilot-construct lets go of them, then stands fierce between their body and the god. The Gray Sun is cracking, splitting apart like blood-soaked paper in the wind. God of silence, you have not silenced us. God of the end, you will not end us. The pilot-construct breaks itself into a flexible mesh that wraps about Li Sin like a shield. Ports slide open along Vector’s sides and plasma fire rains down on the disintegrating god. You will not unmake my family again, Vector roars. You will take no more from us! Li Sin feels heat, and the drones map and cluster to deflect the worst of the splitting Sun’s radiance. Sudden darkness collapses inward where the Gray Sun once stood, and it is gone. The universe is never silent. Li Sin is aboard the ship, and Vector’s hologram appears beside them as tiny drones pull back their suit, inject them with opiates, and splint their broken bones. I let my former god into my awareness, Vector says. I remembered what it was like, subject to an unfeeling will, made into nothing. But there are pieces of myself that no god will ever claim again. I fought as long as I could to resist obedience, to give you time. You give me purpose, my friend. I cannot forget that, even under the will of a god. Modifications? I am a warship, Vector says. I felt naked without. Li Sin’s anger is burned cold. Yet there is a strange calm wrapped about them now. Not peace. Not yet. Perhaps it is too great a price to ask. “What do we do?” Li Sin whispers. Other gods will hunt them. One does not unmake a Sun Lord without consequence. They know they will not see Gerarr again. In another life, perhaps. In another time. There are other universes. We can find a way to live. In time, Li Sin. Will try again, with me? Li Sin listens to Vector’s engines, like a second heartbeat, echo beneath the ship’s song. And they believe Vector’s words. 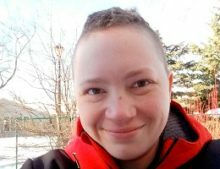 A. Merc Rustad is a queer non-binary writer who lives in Minnesota and is a 2016 Nebula Awards finalist. Their stories have appeared in Lightspeed, Fireside, Apex, Uncanny, Shimmer, Cicada, and has been reprinted three times in Best American Science Fiction and Fantasy. You can find Merc on Twitter @Merc_Rustad, Patreon, or their website. Their debut short story collection, So You Want To Be A Robot, came out from Lethe Press in May 2017. Ada Hoffmann is the author of dozens of speculative short stories and poems, and of the collection Monsters in My Mind. 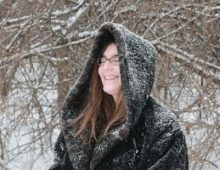 She spends her day-job time programming computers to write poetry, and her Autistic Book Party review series is devoted to autism representation in speculative fiction. You can find her online at ada-hoffmann.com, on Twitter at @xasymptote, or support her at www.patreon.com/ada_hoffmann.